The West London Golf Centre Coffee Shop offers a licensed bar and a wide range of hot drinks, snacks and soft drinks. We do not permit guests to bring their own food and drink to consume on the premises. Will my children be supervised? A member of our team will be available to welcome you on arrival and answer any questions on the day. Mums, dads and guardians MUST supervise their children at all times and if older children are helping siblings, please ensure they fully understand the rules of Dino Soft Play to ensure a safe visit for everyone. How old does an adult need to be? Accompanying adults need to be 18 years and older. Adults must not leave Dino Soft Play Centre whilst their children are playing. Do adults need to pay? No, mums and dads are free to enter whilst supervising their children, and are encouraged to use the soft play seating area which allows you to keep a close eye on whats going on. Dino Soft Play is suitable for children 1-8 years of age. We welcome older children helping their siblings but request they do not play so we can ensure the safety of younger children at all times. 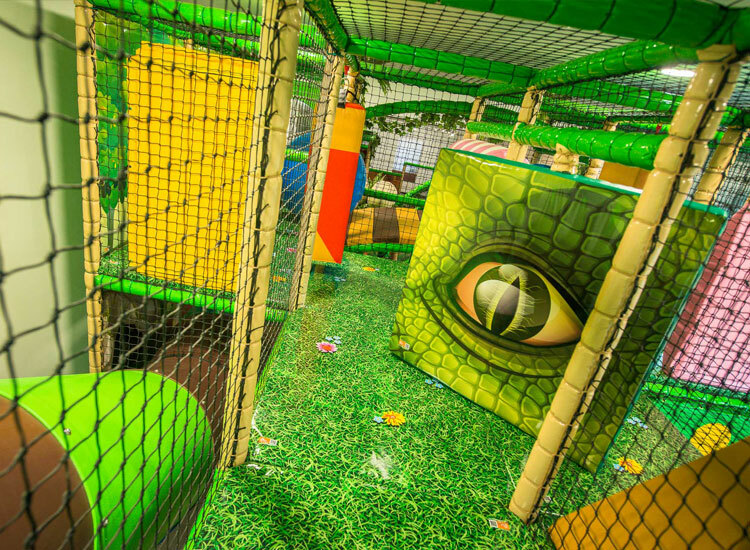 When are the busiest and quietest times for the Dino Soft Play? It can be difficult to say how busy the soft play area will be on a day that you choose to visit, school holiday and event periods are busier than mid week term time dates. However, with a bit of planning you can still have a roaring time. To ensure all children have maximum fun we would recommend comfortable clothes with no hoods. Socks MUST be worn at all times by both children and adults. Please remove jewellery and make sure you empty your pockets of coins and all other items. How do I get to Dino Soft Play by public transport? By Bus: 140, 282, 90 to White Hart roundabout / Yeading. By Train: Northolt station and one of the above buses (140, 282, 90). How should my children behave? We take the safety of your children very seriously and aim to provide a great environment for everyone to enjoy. We fully understand children love to have fun in many different ways. However, any child who behaves in an aggressive manner or continually breaks the Dino Soft play rules will be brought to their parents by a member of the Dino team who will explain the issue. If the child continues to misbehave the family may be asked to leave. This policy is to ensure the safety of all children. Abusive behaviour will not be tolerated and may result in a ban from Dino Soft Play. If you have any further questions please contact us. • Whilst the Dino Soft Play team are happy to be of assistance, we must stress that mums, dads and guardians are responsible for the children in their care.